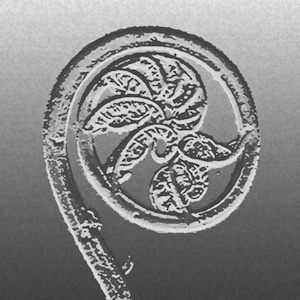 Pteris blumeana J.Agardh, Recens. Spec. Pter. : 22. 1839; Tardieu & C.Chr., Fl. Indo-Chine 7(2): 157. 1940; Tagawa & K.Iwats., SouthE. Asian Stud. 5: 81. 1967; Tagawa & K.Iwats., Fl. Thailand 3: 244. 1985; Boonkerd & Pollawatn, Pterid. Thailand: 127. 2000. – Pteris quadriaurita var. blumeana (J.Agardh) Bedd., Handb. Ferns Brit. India: 112. 1883; Hosseus, Beih. Bot. Centralbl. 28(2): 366. 1911. 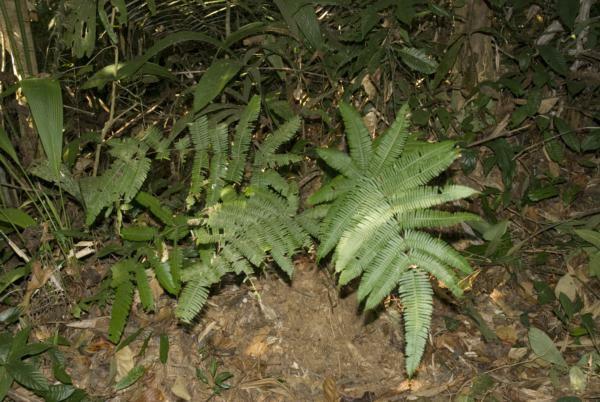 Pteris quadriaurita auct. non Retz. : Christ, Bot. Tidsskr. 24: 106. 1901; C.Chr., Bot. Tidsskr. 32: 348. 1916. Rhizome short, erect, densely scaly at apex; scales linear, up to 8 by 0.8 mm, dark brown with pale ferrugineous margin. Stipes castaneous to purplish in lower part, stramineous or pale brown upwards, puberulous or glabrescent, up to 85 cm long. Laminae oblong with acute apex, deeply bipinnatisect to bipinnate, 40–70 by 35–50 cm; lateral pinnae 2–12 pairs, slightly ascending, nearly straight, lanceolate with truncate base, caudately acuminate at apex, up to 28 by 3–5.5(–6.5) cm, basal pinnae bearing large basiscopic pinnules; rachis and costa grooved on upper surface, more or less hirsute; pinnules patent, straight or slightly falcate, narrowly oblong, rounded to obtuse or rarely moderately acute at apex, up to 36 by 2.5–4.5 mm, entire at margin, adnate and decurrent to the next ones by wings of costa less than 0.5 mm broad; with long spines on upper surface of costa and costules, upper surface of lamina sparsely pubescent, green, papyraceous; veins forked, distinct on both surfaces. Sori continuous along margin of pinnules except at apex and sinus; indusia pale, thin, transparent . NORTHERN: Chiang Mai, Chiang Rai, Lampang, Phitsanulok; NORTH-EASTERN: Loei; EASTERN: Nakhon Ratchasima; SOUTH-WESTERN: Kanchanaburi; CENTRAL: Nakhon Nayok; SOUTH-EASTERN: Chanthaburi, Trat; PENINSULAR: Chumphon, Yala. India, Laos, Cambodia, S Vietnam and Malesia. On usually dry mountain slopes in deep shade or on humus-rich ground in not very dense forests at low or medium altitudes (but to 1200 m alt. on Phu Luang). In some plants a distinct white line is apparent along the costae, but no taxonomic significance can be given to this character, which occurs in other species . Middleton et al. 4758 & 4760, Kanchanaburi, Khao Laem National Park, Kra Teng Jeng Waterfall (E). Harmand 1253, Attapeu (P); Delacour s.n., Khammouane, Nape (P). Pierre 5787, Kampot, Kamchay (P).